Although most people have heard of diabetes, fewer understand the eye-related complications. The raised levels of glucose that are the essence of the disease are a risk to your eyes in a number of ways. The threat of vision loss is increased when diabetes is not treated. Diabetic eye disease can actualize in a number of forms. The most common diabetic eye disease, called diabetic retinopathy, is one of the primary causes of blindness in adults. This condition results when excessive glucose levels cause blockages in the blood vessels around the retina. The blockages lead to blood vessel leakages which can cause irreparable damage to the retina. The retina is the light-sensitive tissue located at the back of the eye, which is a critical component for proper vision. Damage to the retina can cause permanent blindness. While controlling diabetes reduces the likelihood of developing diabetic retinopathy, it does not totally eliminate the risk and this is why it is essential to have your eyes examined annually if you have diabetes. Glucose levels that change periodically can also affect eyesight. Because glucose levels have an impact on the ability of your lens to maintain sharp focus, this can result in blurry vision that fluctuates with blood sugar levels. People with diabetes are at greater risk to develop cataracts, a condition in which the lens of the eye becomes clouded, which impacts vision. Cataracts are a common condition that comes with aging, but develops at an earlier age in those with diabetes. Glaucoma risk in individuals with diabetes is two times that of the normal population. Glaucoma is an elevation in interoptic fluid pressure which causes optic nerve damage and eventually blindness. Having control of your diabetes is the best form of prevention for any of the diabetic eye diseases. As well as maintaining proper levels of glucose by means of diet and/or insulin, it’s important to exercise and refrain from smoking. 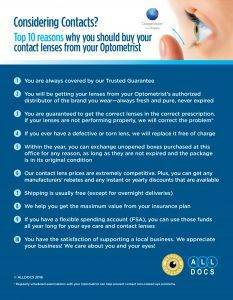 Additionally, it is essential to have yearly eye exams with an optometrist to detect any damage early on. While in many cases vision loss caused by any of these conditions cannot be reversed, early detection and treatment can often prevent continuing damage and disease progression.